Disaster Preparedness and My First Giveaway Ever! Read to the end to get to the giveaway! Living in an area of California that’s prone to natural disasters (Hi earthquakes! Wild Fires — I’m looking your way! ), there’s frequently a paranoid little voice in the back of my head telling me that we need to be prepared for some horrible, catastrophic circumstances. Zach and I have always been pretty good about having a first aid kit around, but it wasn’t until we had kids that we started thinking about disaster preparedness a little more seriously. Throw in Hurricane Katrina and the flooding of my home town last summer and we actually went out and did something about it. Zach downloaded a list of suggested contents for a “go bag” from the internet, he bought a couple of cheap backpacks and we threw some energy bars, water bottles, a space blanket and some more serious first aid items in them. But then some other stuff came up in our lives. The backpacks were taken down to the basement and the project fell by the way side. How many of you have projects like that? Are they important projects? Do you feel guilty about them? Does that make you finish them up? Yeah — me neither. Because really, who wants to prepare for your state falling into the ocean when you can check in on your social network sites? So with all this in mind, I was psyched to get an invitation to attend an event put on by the California Volunteers at Rookie Mom Heather’s house. The California Volunteers folks told us about a couple of new service on their web site — a fill in the blank disaster plan form and a kids book that allows you to customize it with your child’s name and helps teach disaster preparedness in a non-threatening way. Any preparation you can do is better than no preparation. Those partly assembled backpacks in our basement aren’t half bad. Now we just need to add a few more things to them and we’ll be in good shape. Put your kits in backpacks, rolling suitcases, etc. so that you can grab them and throw them in your car if you need to or you can carry them if you’re on foot. Store food you kids will eat! If they don’t like peanut butter don’t put that in your kit. I loved Whitney’s suggestion to put shelf stable chocolate milk in for the kids. Make sure you refresh your kits every six months — rotate food and water, make sure your kids’ clothes and diapers still fit, check freshness of medications, etc. Even if you breast feed have formula for your baby! This never would have occurred to me, because I just assume that I’ll always be able to feed Augie when he’s hungry, but what if I was off somewhere else (or worse, injured!) and Zach needed to care for Augie when the Big One hits? In goes the formula! Be sure to include some cash in your kit and make sure you store it in small bills. It’s going to be tough to find someone who’ll break a $100 bill when you want to buy a loaf of bread. Arrange a neighborhood meeting spot to meet. Choose a spot where the kids don’t have to cross the street if they’re small. Don’t let your gas tank go lower than half-full. If there’s a big disaster the gas stations might not be able to pump so you won’t be able to fill up to get to your out-of-state meeting or evacuation point. Strap heavy things to walls — shelves, tv’s, big framed art — anything that might fall down and crush you. This is just good sense when you have little kids around anyway. Try not to put your beds under windows so you aren’t showered with glass while you sleep. Also, don’t hang framed art over beds. Keep shoes, rubber soled slippers or even flip-flops by everyones’ beds. If there’s an earthquake in the night, the first thing you’ll do is jump up to check on your kids and you don’t want to run into their rooms and shred your feet on broken glass. Consider putting child proof latches on upper kitchen cabinets as well as lower cabinets to keep dishes and glasses from falling all over your kitchen. You can drink the water out of your hot water heater if you need to. Drain the sediment out of it yearly. Buy a wind-up flashlight and always store it in the same spot. That way you can always find it and you don’t have to worry about your kids playing with it so much that your batteries run out. Have a land-line and a corded phone! A lot of people are going to cell phones only these days and even those who have land-lines tend to use cordless phones (like us). Cell phones can’t be counted on to work in a disaster and if your power goes out, your cordless phone won’t work either. Erica suggested keeping an old, cheap corded phone in a drawer somewhere so you can pull it out when you need it. OK, enough lecturing! Time for the giveaway! I have twelve — TWELVE! 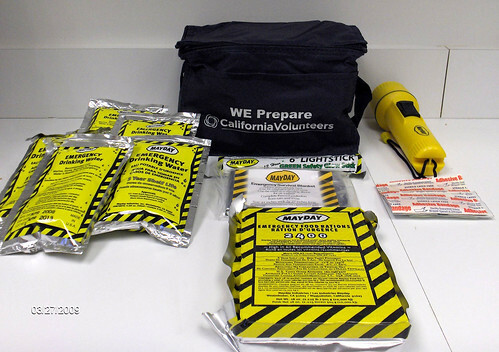 — disaster kits to give away, courtesy of the California Volunteers. Your chances of winning one of these are pretty good! Each kit contains drinking water, a block of survival food, a glow stick, flashlight and some first aid supplies. These are a great size to keep in your car, or they could be used as a “starter kit” for assembling your own back pack kits. To win one, share a safety tip or something your family has done to prepare for a disaster in the comments below by the end of the day on April 20. I’ll choose 12 winners at random. You don’t have to live in California to win, but you do need to live in the U.S.